Researchers at the Institute of Rehabilitation at the University of Hull are using Kendata Peripherals' forms-processing bureau service for the data-entry work on their latest neck-pain project, thereby freeing up more time to spend on actual analysis of the results. Designed to compare the effectiveness of two types of physiotherapy intervention, the Get Up Neck Trial project gathers information from 150 patients by means of a detailed 12-page baseline questionnaire and three 8-page follow-up questionnaires. While most of the questions are in multiple-choice format requiring responses in check-mark boxes, the answer sheets also include some free text boxes. According to Superintendent Physiotherapist, Sionnadh McLean, entering the data manually would have been a time-consuming process: "We have used manual data-entry techniques in the past: as well as being a laborious task taking many hours, it also has to be repeated by a second person in order to verify the accuracy of the data." For these reasons the research team decided to adopt an automated approach to data entry and, after having evaluated alternative solutions, they settled on the bureau service provided by Kendata Peripherals. In addition to handling the automated scanning of questionnaires and surveys, Kendata also offers a professional design and print service particularly geared to the special requirements of data-collection forms. Working closely with the Hull researchers, Kendata designed the baseline and follow-up questionnaires so that they were not only optimised for scanning but also easy for patients to fill in. Using automated systems and its own in-house developed forms-processing software, Kendata is able to process thousands of forms in a short period of time. This software minimises the need for operator intervention and handles the decision making when errors such as double marking are detected. 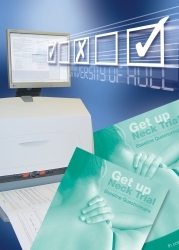 As each sheet is scanned, a unique identification number is printed on it to provide a complete audit trail, which is especially important when dealing with longer questionnaire booklets - such as those used by the Hull research team - as they have to be separated into individual sheets prior to scanning. In addition, the software randomly selects a certain number of forms for QA validation from each batch, thereby ensuring that quality assurance checks are carried out in accordance with the sampling requirements of ISO2859/BS6001. The bureau supplies the Hull team with an Excel database, which they then import into their SPSS package for detailed analysis. All free-text boxes are captured as PDFs with filenames that can be cross-referenced to the original data. Another increasingly popular feature of Kendata's scanning bureau service is the online tracking facility, which uses a password-protected area of the company's website to allow clients to quickly and easily monitor the quantities of questionnaires received and scanned each day. "Even though the project involved only 150 patients, there were thousands of pages of data to enter, so it was well worth using the Kendata bureau service," concluded Sionnadh McLean. "As well as being much faster, scanning the completed forms also achieved the required accuracy without the need for double data entry."